Daiwa's Opus Spinning Reel is an affordable choice for general-duty fishing, and are well-equipped and geared for extra power. The Opus Reel's reliable ball-bearing drive is backed by an advanced levelwind system for trouble-free retrieves, while the Gyro Spin balancing system works to eliminate wobble. Twist Buster line roller; lifetime bailspring; Infinite Anti-Reverse system with one-way roller bearing. 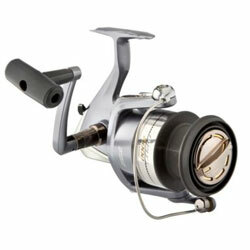 "Great reel for overall heavy duty fishing. Good reel capacity. Great and smooth retrive. " "I bought one for a spod reel(spod is used to chum for carp). Reeling in a large spod from apprx 70 yards several times on the first day I used it caused the reel to make a lot of noise. Sounds like it has gravel in it. If you plan to catch large fish or use heavy baits, buy something else. " ""Its a good reel, but not for big catfish....wrecked the handle twice fighting the big ones out....good line capacity, great retrival, but not for heavy duty catfishin..."